The Sacramento area will bask in temperatures in the low 90’s for the next five days according to Accuweather. NOAA claimed this week, recent storms in California have provided widespread drought relief, but also caused deadly and destructive flooding and mudslides. Last week residents were evacuated from their homes as water poured over the damaged spillway at the Oroville Dam. Many rivers and creeks in the Central Valley and around Northern California are at or above flood stage. This spring, and possibly before the end of winter, we should see some warming up, which could cause snow to melt faster and flood some areas. Snow in the high Sierras tends to produce a gradual runoff that should keep rivers and reservoirs at healthy levels through the dry season, though the sheer volume of expected runoff could cause flooding. 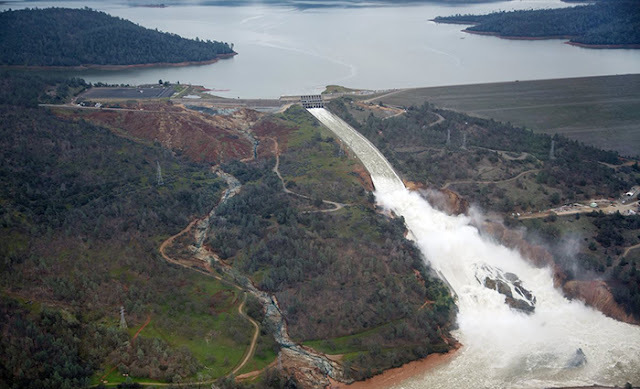 Oroville Dam--there is another 'dam' underground, but it is powered by electricity & the power was cut when poles were removed because of the spillway damage. The turbines in this underground 'dam' are now clogged with debris. The reason Oroville has not failed is the 9 dams in the watershed above Oroville Dam have held back waters. They are at or are at near capacity with flooding occurring in surrounding towns/roads. Warm weather & more storms on the way?